The aim of this study was to develop a one-step synthesis of gold nanotriangles (NTs) in the presence of mixed phospholipid vesicles followed by a separation process to isolate purified NTs. Negatively charged vesicles containing AOT and phospholipids, in the absence and presence of additional reducing agents (polyampholytes, polyanions or low molecular weight compounds), were used as a template phase to form anisotropic gold nanoparticles. Upon addition of the gold chloride solution, the nucleation process is initiated and both types of particles, i.e., isotropic spherical and anisotropic gold nanotriangles, are formed simultaneously. 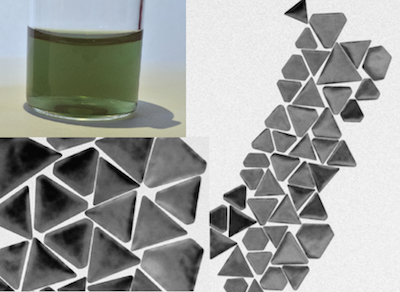 As it was not possible to produce monodisperse nanotriangles with such a one-step procedure, the anisotropic nanoparticles needed to be separated from the spherical ones. Therefore, a new type of separation procedure using combined polyelectrolyte/micelle depletion flocculation was successfully applied. As a result of the different purification steps, a green colored aqueous dispersion was obtained containing highly purified, well-defined negatively charged flat nanocrystals with a platelet thickness of 10 nm and an edge length of about 175 nm. The NTs produce promising results in surface-enhanced Raman scattering.